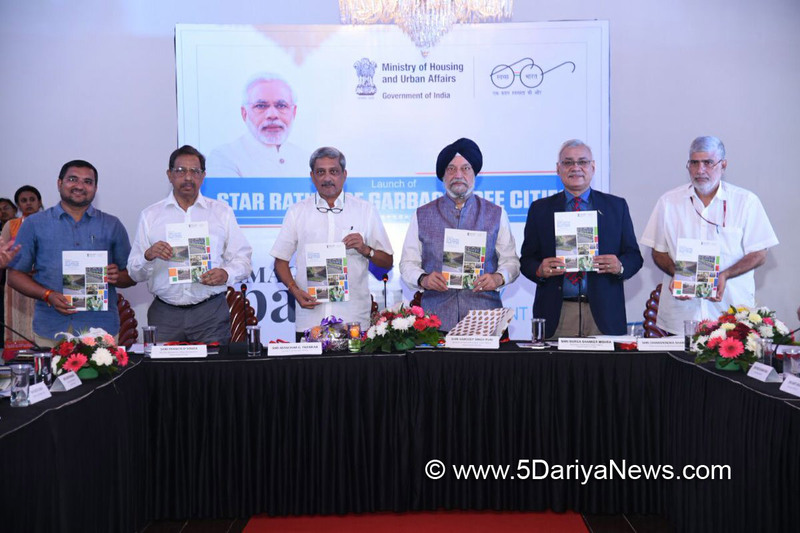 Shri Hardeep Singh Puri, Minister of State (I/C) for Housing and Urban Affairs along with the Chief Minister of Goa, Shri Manohar Parrikar today launched the ‘Protocol for Star Rating of Garbage-Free Cities’ in Goa. The star-rating initiative, developed by the Swachh Bharat Mission – Urban will be rating cities on a 7-star rating system based on multiple cleanliness indicators for solid waste management, which will include Door to Door Collection, bulk generator compliance, source segregation, sweeping, scientific processing of waste, scientific land filling, plastic waste management, construction and demolition management, dump remediation & citizen grievance redressal system etc.Cities can be rated as 1, 2, 3, 4, 5 and 7 star based on their compliance with the protocol conditions specified for each of the rating. Further city should be ODF(Open Defecation Free) before it could be given rating of 3 star or above. While cities may self-declare themselves as 1-star, 2-star or 4-star, MoHUA will carry out an additional verification through an independent third party to certify cities as 3-star, 5-star or 7-star. Cities will need to get recertified themselves every year to retain their star-status. Sh Hardeep Puri, Housing and Urban Affairs Minister also informed that Goa being a young and a vibrant state given its socio-economic profile has immense potential in the affordable housing sector. Therefore, Pardhan Mantri Awas Yojana- Urban (PMAY-U) is an important mission to cater to the overall demand of affordable housing in Goa. The housing demand statistics registered in the PMAY-MIS indicates that there is housing demand for about 5,000 houses across the entire State in all 14 Urban Statutory towns included in the PMAY(U) Mission. About 1000 demand has been already registered in the CLSS component of PMAY(U) in Goa. Due to its vast tourism let economic activities, the facility of CLSS can be widely availed by the Aspirational class in EWS, MIG & LIG categories in the State of Goa. As of now 61 beneficiaries have already availed an interest subsidy of Rs. 1.28 crore in their home loan accounts under CLSS of PMAY (U). State has been requested to focus on MIG category for availing subsidy under CLSS due to its large working population. The 2011 Census has also reported 4,846 slum households in 3 towns (Ponda, Mormugao and Margao). The State Government has been requested to take up projects under In-Situ Slum Redevelopment projects (ISSR) component of PMAY(U) for making the cities clean and providing dignified living to slum households. The State of Goa has assured to bring project proposals under BLC component during the forthcoming CSMC which is scheduled to be held on 31.1.2018. The State has been requested to ensure budgetary provision matching with the Proposals/ AIP and to ensure availability of encumbrance free land for meeting the demand for houses. State has also been requested to opt for technology neutral bidding process for adopting modern, innovative and green technologies and building materials.